All about being actively involved in Cusco’s Sacred Valley…eco coffee time! This volunteer project is all about coffee! You will meet the families of small scale coffee farmers and will actively get to know the coffee farming process. Actively because you will hike over spectacular Inca trails towards the coffee farms passing coffee fields where they have cultivated coffee for generations. The villages are all situated close to Machu Picchu so you could combine your volunteer work with a visit to the spectacular lost and sacred city of the Incas. Read the following testimonial of a former volunteer at this exciting ecological project! This project was better than I could even imagine! I met some amazing families and learned a huge amount about coffee, fruits and most of all the style of life of a Peruvian family! The moment I arrived in my first family (that lives in Huayopata – about 1 hour away from Quillabamba), I was greeted with a huge hug and offered jugo de platano y papaya (banana and papaya juice) fresh from their garden! That basically describes the whole stay! You will help the family with the work on the farm, anything from watering the plants to cutting a banana tree down! The food you will eat here is all fresh, whether it comes from their farm or the local market. The coffee is amazing! Everything is organic. The family was very warm, in fact I became part of their family and I hope I will be able to go back. They will make you love the Peruvian culture. Guatemala is a captivating country rich with cultural heritage and breathtaking landscapes. However, it is also a country whose people have endured a brutal 36-year civil war. The effects of war continue today, and the Casa Guatemala project aims to assist the most helpless of those affected – Guatemala’s children. 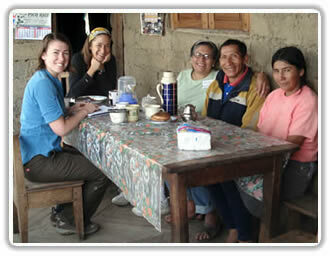 We spoke with Heather Graham, Casa Guatemala Project leader, about the project, its achievements, challenges, and goals. VOLUNTEER WORK LATIN AMERICA: Can you briefly describe your project and its mission? HEATHER: Casa Guatemala provides a safe, nurturing home, health care and education to Guatemala’s abused, abandoned, and malnourished children. It also provides an environment that allows its young adults to gain practical job skills through its various business operations. VOLUNTEER WORK LATIN AMERICA: Tell me a little bit about yourself? How did you get involved with Casa Guatemala? HEATHER: I first came to the project as a volunteer 10 years ago. I planned to volunteer for 3 months, but I ended up staying 3 years! Since those first 3 years, I have worked on and off with Casa Guatemala and about a year ago, I decided to work full-time as Casa Guatemala’s Project Leader. Having recently completed our Masters in Social Work, Sofie and I decided to leave Belgium to spend four months travelling in South America. After starting in Quito, Ecuador, we travelled down to the beautiful city of Cusco to begin a month of volunteer work. The project we worked on provides care to people living in neglect, suffering from psychological and psychiatric diseases including the treatment of addiction. During our time here we worked with people with mental disabilities. Our day started at 8.30am and we worked for roughly four hours per day doing a range of activities. We spent a lot of time decorating communal areas such as the dining room and outdoor walls, along with private rooms too. We spent a lot of time drawing things that the residents could then color in themselves, as this was an activity that most of them were able to participate in and really enjoyed doing. In January/February 2011 I worked at a clinic for mentally and physical disabled children. In my first weeks I took care of the patients (which I now call friends) by brushing their teeth, changing their clothes, entertaining or feeding them. As most of them suffer from severe handicaps I was really unsure if I was going to handle my work well. After my first day of work I realized that I really did not have any “problems” working with the kids; I did not even see their disabilities any longer. We really had the same goal: being happy and laughing as much as we could. Their joy struck me and opened my eyes and attitude towards certain issues. This volunteer work has allowed us to experience the universal magic of childhood in a culture very different from our own. Thank you for the opportunity to work with Rossana, Elizabeth, Marina, Raul, and Marlene, and of course the very junior citizens of Cusco. We have been made to feel very welcome at the centre. The staff has been patient with our emerging Spanish abilities and have even offered us introductory Quechua! The hours are well suited to morning people and leave a good portion of the day available for more Spanish classes, exploring, or shopping. The volunteers’ Spanish classes were very helpful in arming us with the necessary “imperativo” form of communication – “!No hagas eso!”, “!No grites!” etc. When I first came to South America I was consumed with thoughts of Argentina. Thus when my housemate decided to take a trip up to Peru a month into our stay I was caught a little bit off guard. My initial reaction: why would anyone want to leave a place this great so soon? With time, however, the thought of accompanying her became more and more appealing and a month after my friend first breached the subject, we were on the road headed to Pisco, Peru. Why Pisco? (For those of you who are unfamiliar with South American geography: Pisco is a tiny city on the South West Coast of Peru; let´s just say it didn´t exactly make the cut for top ten places to visit in Peru, it claims two pages in SA’s Lonely Planet’s guide). Given our intents to volunteer, however, the lack of tourist attractions in Pisco was not exactly an issue . Indeed, our time was kept busy with the construction of houses for local families. Not only did this experience add some real substance to my travels in SA, but it was incredibly fun as well. If you have the time to do some volunteer work during your stay I highly recommend it.